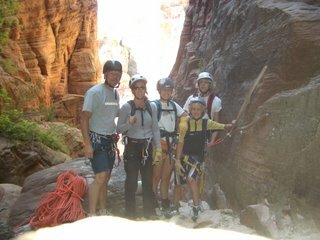 On Monday, Memorial Day, I talked the family into canyoneering in Zion. We started out fairly early on a sunny but cool morning. It was myself, Deb, Mart, Rebecca and Eric. The canyon is known as "Lodge Canyon" because it drops into the drainage just above the old Zion Lodge. We had to spot a second vehicle in the lower canyon and then drive the truck through the tunnel and start in upper Pine Creek. The hiking was steep at first on beautiful slickrock. While heading up over a saddle we spotted 3 desert bighorn sheep above us. Eric kept asking about every 10 minutes if we were at the top yet. Although we did make it to the top of the pass, I led them down the wrong side drainage and we ended up pioneering a new route variation. It was sort of fun to place new anchors and problem solve while we dropped back into the main drainage, however, it did cost us 2 hours of time to negotiate the "Larsen Variation". We did take a ten minute side trip up to a short but deep dark slot at the base of Mountain of the Sun. It seemed as if we had stepped into a cave and it took several minutes for our eyes to adjust. It was about a half mile of walking down a sandy wash before we came to the first rap in the Lodge Canyon drainage. The next 1/4 mile of the canyon took us about 4 hours to negotiate as there were several raps stacked into the last part of the canyon. The second to the last rap started from a small ledge and required setting up on an "extended anchor". Marty used a smaller rope and belayed all of us at the start of this rap. Even so, Deb found this situation to be out of her comfort zone and shook with anticipation. The last rap is about 185 feet and mostly overhanging and drops your into a beautiful grotto with springs and waterfalls and hanging gardens. 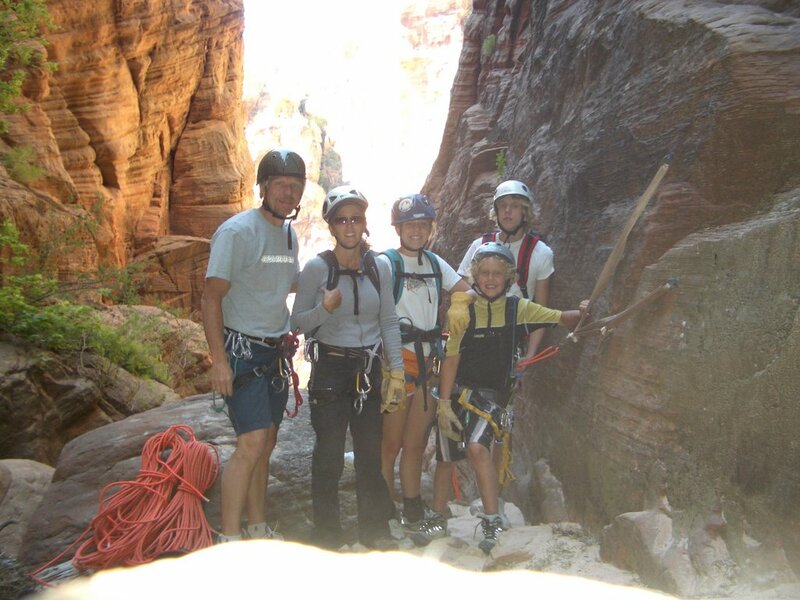 We then scrambled down a boulder and tree choked drainage to the Zion summer employee houses and barracks. The shuttle bus then picked us up at the Zion Lodge where we looked a little out of place with our dusty and sweaty clothes as well as our packs full of ropes and other gear. Once again we had experienced Zion a little differently than the other "tourists" riding the shuttle.